Norway is a land of intense natural beauty which is hard to overstate, especially in winter, its signature season. Mountains of dizzying heights, deep fjords carved out by ice age glaciers, waterfalls cascading down mountainsides, and the awe-inspiring Northern Lights. Spectacular architecture, quaint, affluent cities and exciting local cuisine enhance the experience further. Norway’s natural wonders, dramatic and diverse, range from serene forest-covered hills in the southeast, spectacular fjords and glaciers in the west, and the Arctic wilderness in the north. The seals and eagles reign, the whales and fish patrol the deep fjords, and small villages sleep along the sides of each fjord. The Norway in Winter adventure will awake the explorer in you. 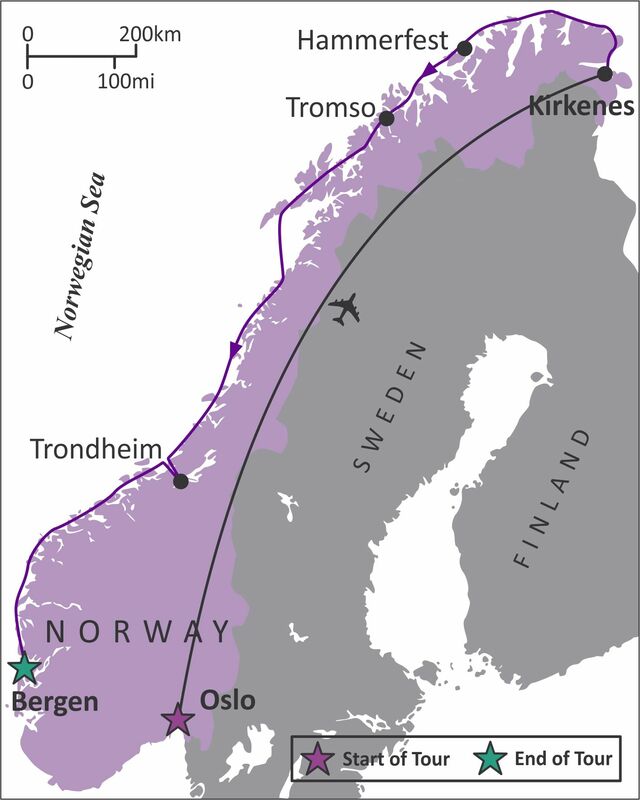 We'll journey from the sophisticated capital city of Oslo to the tiny Kirkenes in the extreme Arctic wilderness, then follow the West Coast among the world's most beautiful islands and fjords to end the adventure in the historic Old World Bergen. With its stirring and varied landscapes, the Norwegian coast is one of the most exciting and varied adventure destinations in the world, and we will explore this rugged coastline, coming face-to-face with natural wonders of epic proportions and enjoying the local culture and the everyday life of people who live here. We'll spend 2 days in Oslo, staying at an upscale hotel in the heart of Norway's sophisticated capital, and visiting its cultural highlights: the Vigeland Sculpture Park, the Open Air Museum and the Viking Ship Museum. Then, we'll fly to Kirkenes, in the extreme Arctic and spend a night at Snowhotel which in itself is an experience of a lifetime. In Kirkenes, we'll board a Hurtigruten Expedition Ship, and travel for 6 days along the West Coast of Norway until we reach the old Hanseatic League town of Bergen, staying for another 2 days. From here, we'll venture out to experience Norway in a Nutshell, the iconic train and boat journey that traverses the hauntingly beautiful Norwegian landscapes of the magnificent fjords, idyllic rural vistas, taking the spectacular Flam Mountain Railway and cruising on the Aurlandsfjord and the narrow Nærøyfjord. 2 nights in an upscale designer hotel, located in the heart of cosmopolitan Oslo; 1 night at an ice suite in Kirkenes Snowhotel; 5 nights aboard the M/S Trollfjord, a Hurtigruten Expedition Ship; 2 nights in a wharf-side luxury hotel in Bergen's Old Town. Delicious local meals: 10 breakfasts, 7 lunches, 8 dinners, including drinks. Domestic flight from Oslo to Kirkenes. Private airport transfers on arrival and on departure. Private guided tour of Oslo, including the Vigeland Sculpture Park and the Viking Ship Museum. Private guided tour of Bergen, including the Fløibanen funicular. Full day Norway in a Nutshell excursion from Bergen, including high altitude Bergen train ride, a cruise through the narrow Nærøyfjord and the Flåm Railway. Midnight concert at Tromsø's Arctic Cathedral. Trondheim private city tour, including the Nidaros Cathedral (outside only). Lectures, presentations and activities onboard the expedition ship. Experienced tour director throughout the tour, all activities, sightseeing fees and admissions as per itinerary. All restaurants', guides' and drivers' gratuities throughout the tour. Additional/optional costs may include: optional single room supplement, additional accommodations in Oslo or in Bergen, early hotel check-in, additional, optional excursions from M/S Trollfjord, medical travel insurance (required for Norway), optional tour director's gratuity, meals not included in the itinerary, telephone charges, laundry, minibar, and personal expenses.